A website CMS (Content Management System) is an easier way that allows anyone in your business to update key areas of your website. While CMS’ are great it’s important to ensure they are set up to allow the maximum yield, especially if you’re looking at growing your online presence. 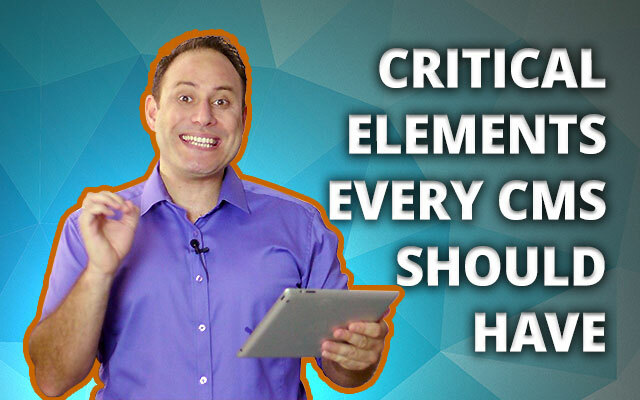 Hey David Judge, today we’re going to discuss what elements an online marketer likes within a CMS. I’m a reasonably technically minded so I’m also going to discuss this from a web usability perspective, focussing on what search engines want in order to get the maximum result. Also…. we’ll discuss exactly what a CMS is, the key areas you should be able to control and why each of these areas are so important. Ok, before we get started let’s explain exactly what a CMS. CMS stands for content management system and is an easy way for ‘non technical’ method for people to add, edit and manage the content on a website. While CMS’ allow you to perform these tasks, a good CMS will perform a lot of ‘behind the scenes’ work. WordPress is one of the most commonly used Content Management Systems as it’s FREE, allows you to set up and customise so many areas at the same time being very simple for nearly anyone to use. On the flip side, because wordpress is so widely used (in 2014 being the most commonly used CMS’ @ over 60 million WP websites online) a lot of hackers try to and are successful at getting access to your website, when they get in they can do some pretty nasty stuff too. So the first thing is any CMS you use should offer ‘security’. WordPress have what they call plug-ins (which are add-ons that customise the functionality of your website) and a very popular plugin people use for security is called WordFence. Ok, so that’s the first area. The second is for it to be SEO friendly. A lot of CMS’ say they are SEO friendly so lets be more specific on what that means. Some of these are a little technical, but as we mentioned earlier, WordPress offers a lot of these functionalities as standard. Ok next is social media. This is pretty simple and you should basically have the ability to add social buttons to your site, allow people to comment (where allowable) and to place those comments onto a social profile, and to show other important social information about your other social presences. Your social buttons, etc. should not over-empower the rest of your site as they are there to support your website and ultimately you want to keep your visitors on your website. When it comes to comments, Disqus is actually a really powerful platform that helps control your comments and how people interact socially on your site. It can be added to many different types of CMS’ and is one of the best commenting systems in the marketplace. Ok, finally and this is an optional extra… A CMS should contain the ability to create landing pages! Landing pages are the ultimate tool when using paid advertising as they allow you to set up ‘stand alone’ pages on your website that present people with a clear focussed offer. I’ve actually made a video about that previously ‘here’ where I explain elements of a landing page and how it should all fit together. If you can get this on a site along with the other functions mentioned earlier then you’re on a very good CMS. Ok, that’s it and remember Content Management Systems are supposed to be an ‘Easy’, ‘Non Technical’ method to add, edit and manage content. If they are too hard to use then it defeats the purpose of a CMS in the first place and the promise of why you would want to use one. So choose wisely and ensure you’re covering at least the areas around security, SEO and social. Ok, great. Let’s wrap up… in the next video we’re going to talk about Search Engine Visibility. We’re going to discuss why Search Engine Visibility is more than just ‘ranking in top spots for a few keywords’ and why most SEO’s are doing this whole thing the wrong way.